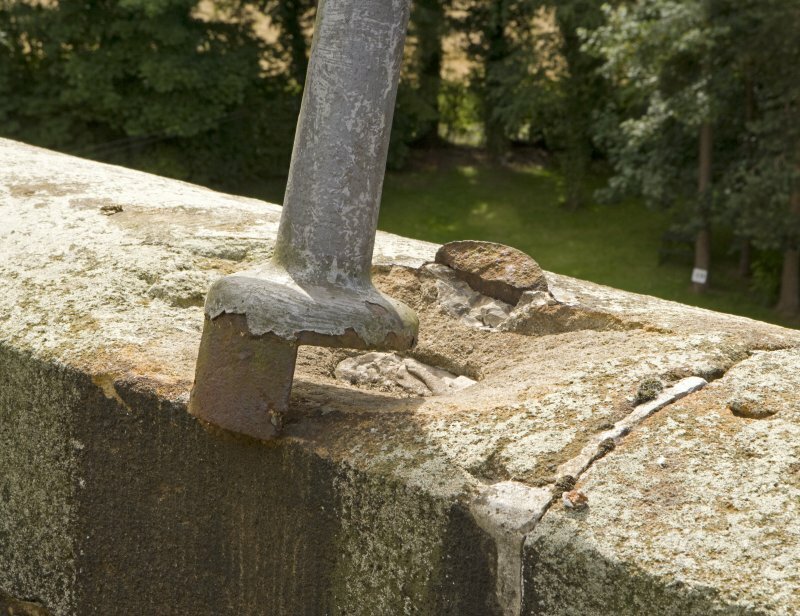 Detail of S side bridge parapet and handrail. 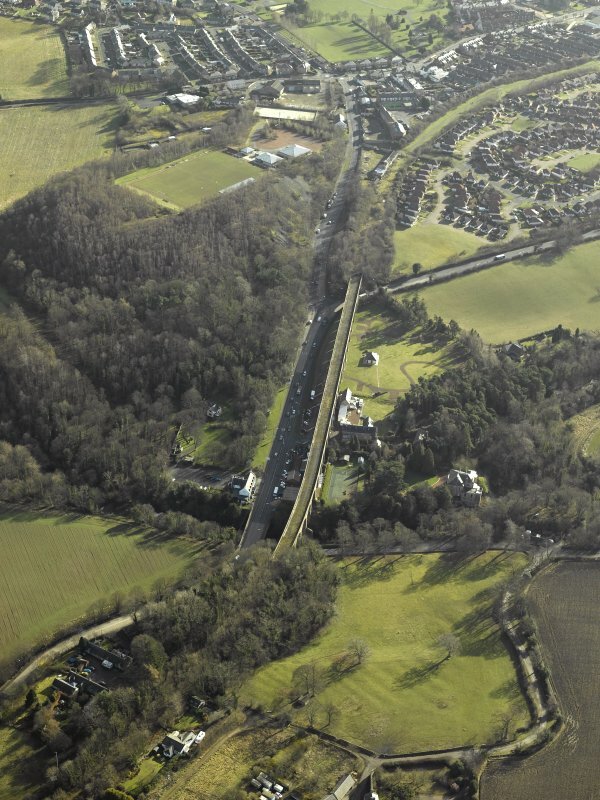 Oblique aerial view centred on Newbattle railway viaduct, taken from the NW. 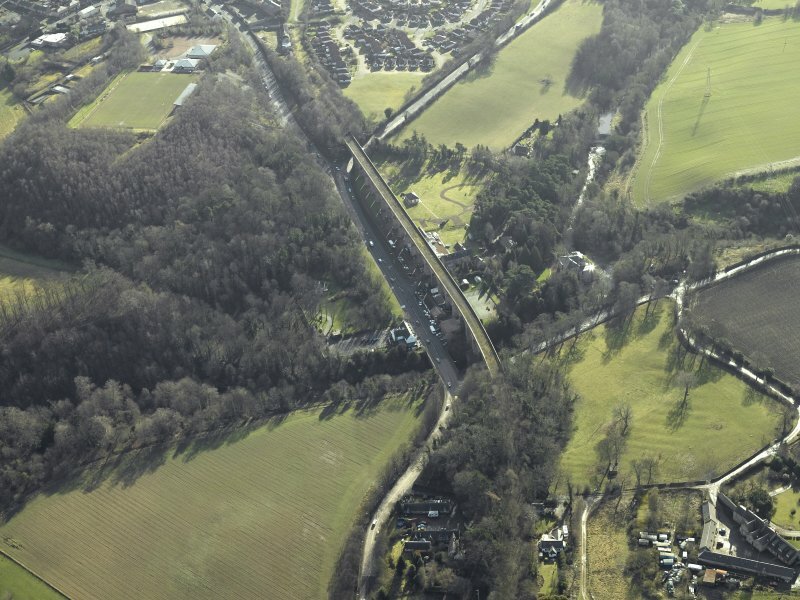 Oblique aerial view centred on Newbattle railway viaduct, taken from the NE. 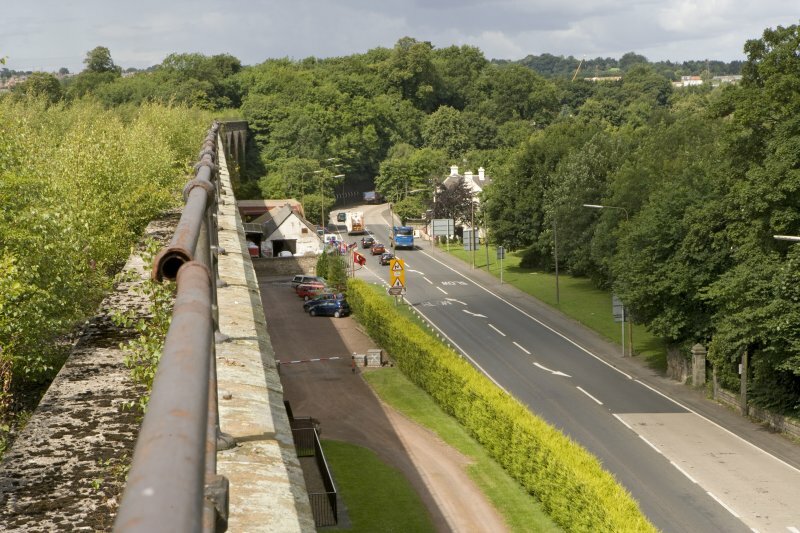 View from viaduct of Sun Inn and A7 trunk road from SE. 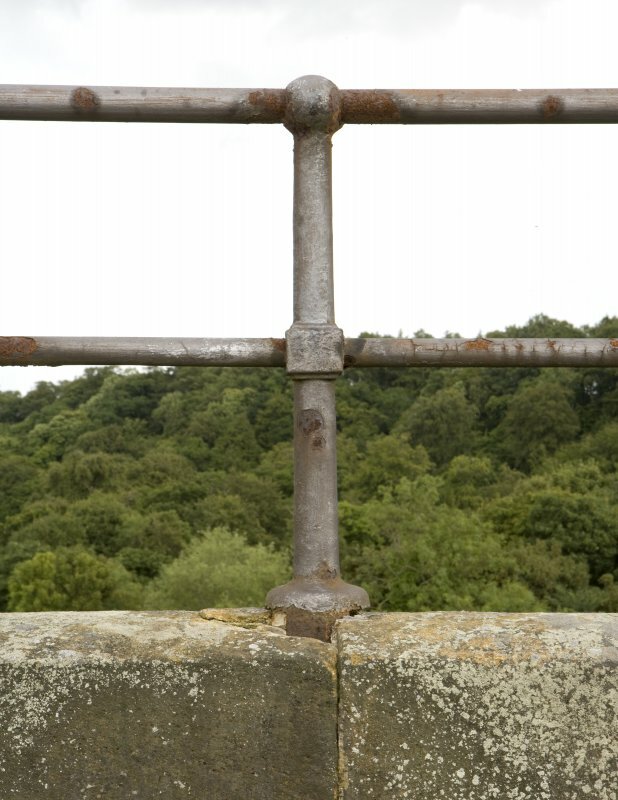 Detail of bridge parapet and handrail from SE. 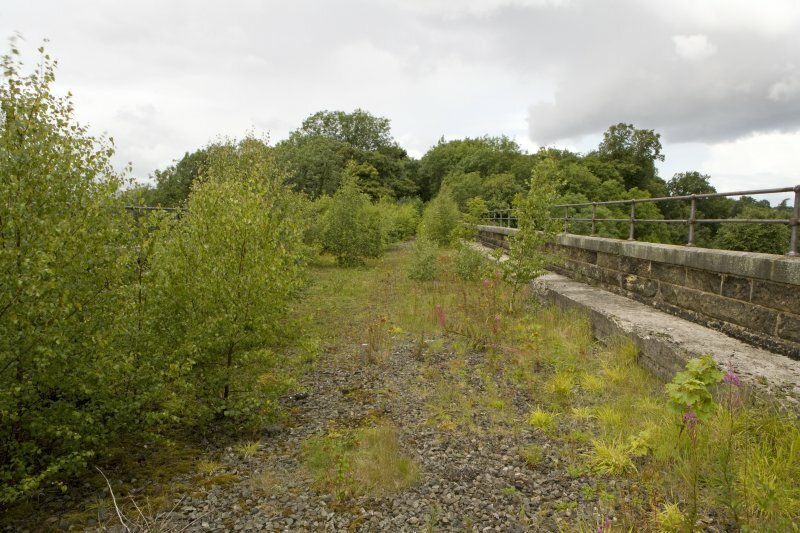 General view of bridge deck with N parapet showing surviving ballast. 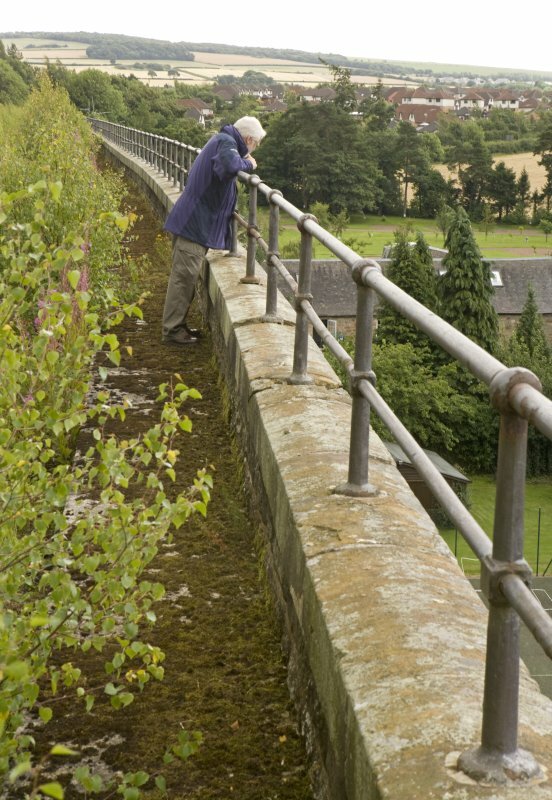 Oblique aerial view centred on Newbattle railway viaduct, taken from the N.
General view of bridge from E.
View of RCAHMS field surveyor David Easton examining the bridge parapet and cutwater below. 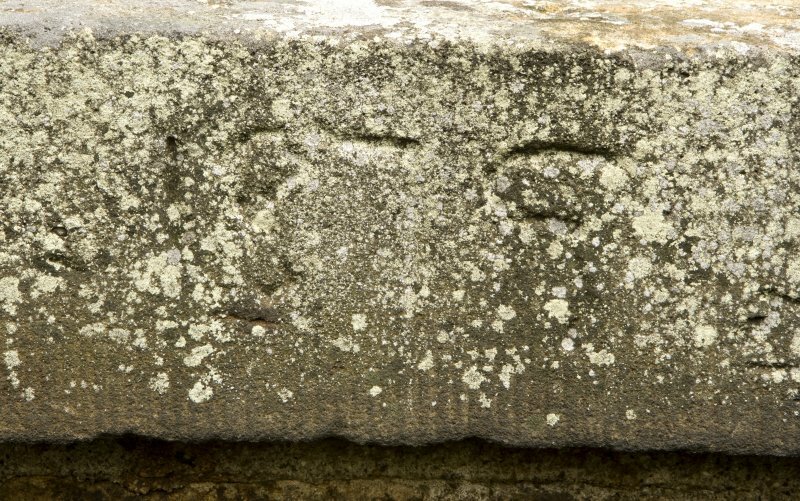 Detail of the top of the N side cutwater in River South Esk from bridge deck. 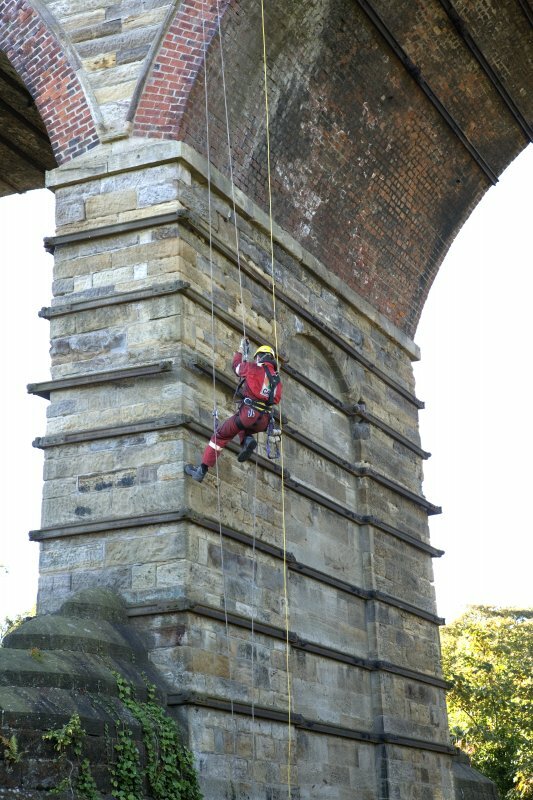 Detail, view from SW, of drill operator abseiling whilst fixing the drill rig during test drilling lower pier and cutwater of the viaduct. 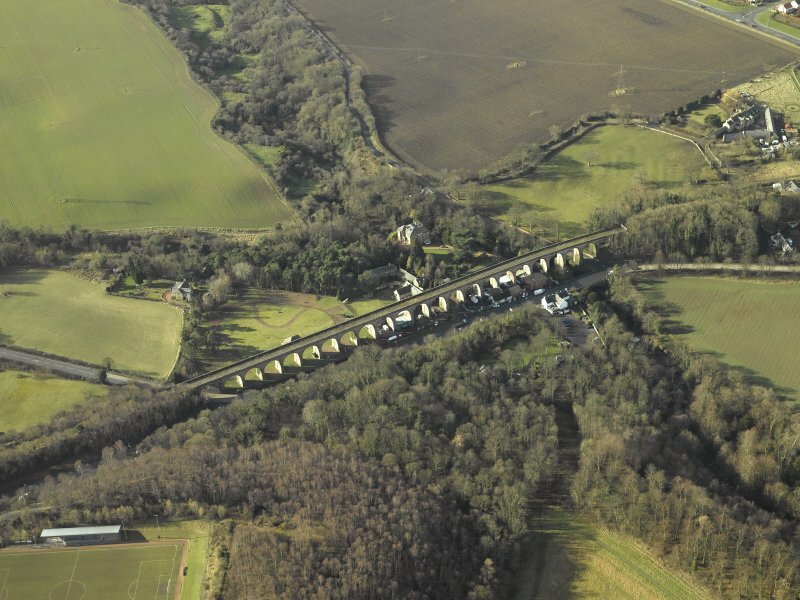 Oblique aerial view centred on Newbattle Railway Viaduct, the Sun Hotel, Lothianbridge, Craigesk House Mill and Damside Cottage, taken from the SW. 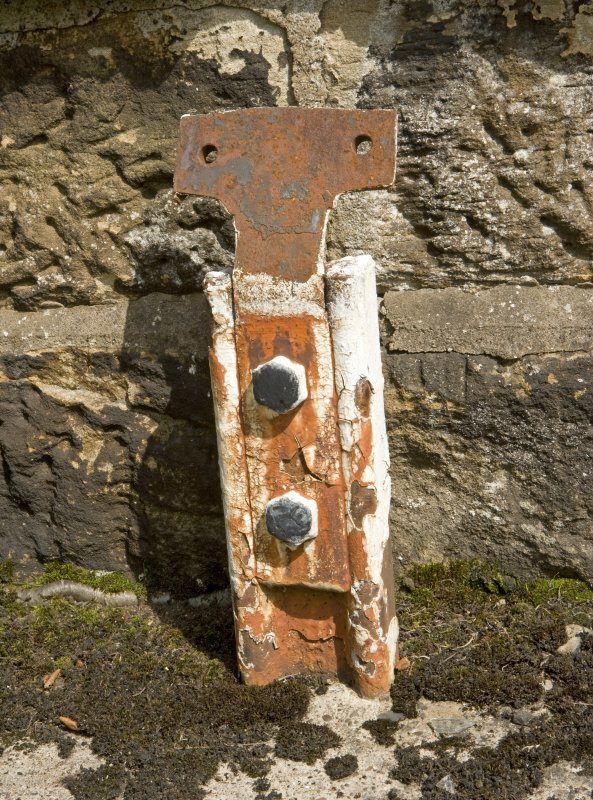 Detail of milepost bracket on N side of bridge. 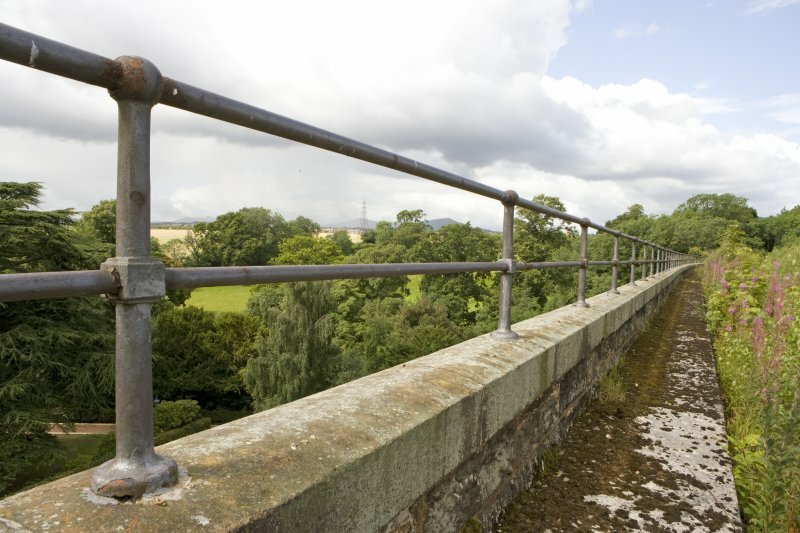 Detail of S side bridge parapet, walkway and handrail. 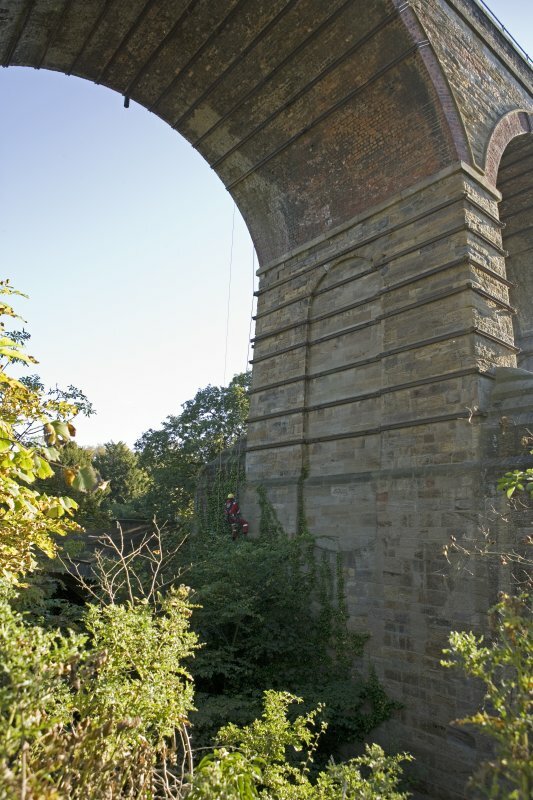 General view from SW, of drill operator abseiling whilst test drilling lower pier of viaduct. 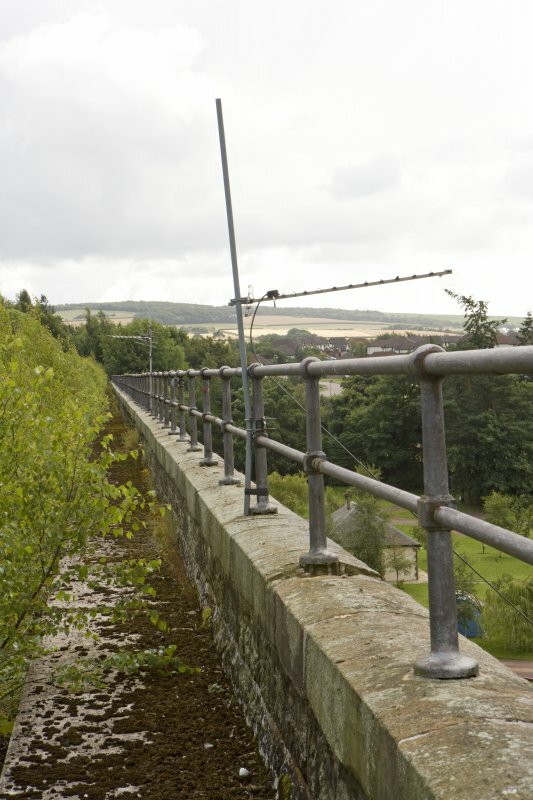 Oblique aerial view centred on Newbattle Railway Viaduct, the Sun Hotel, Lothianbridge, Craigesk House Mill and Damside Cottage, taken from the W.
Detail of S side bridge parapet and handrail showing raised walkway. 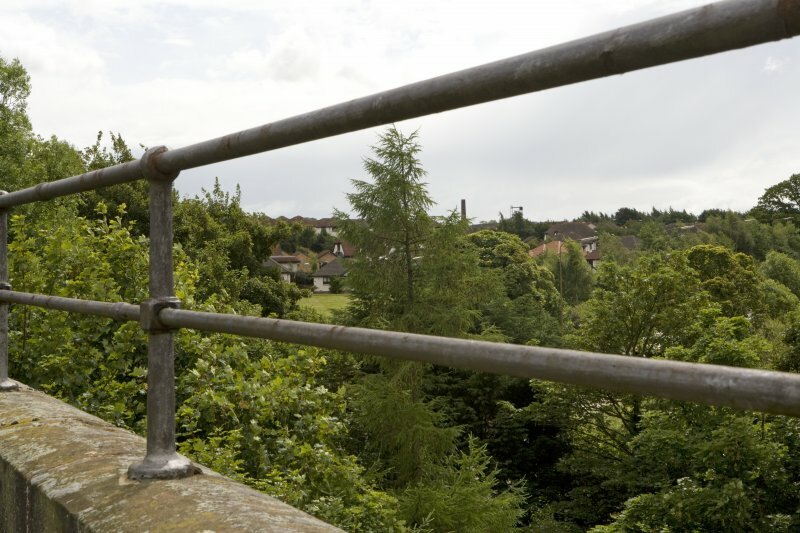 Oblique aerial view centred on Newbattle Railway Viaduct with King's Gate housing estate in the background, taken from the S.
Detail of handrail base on S side of viaduct showing damage to stonework. 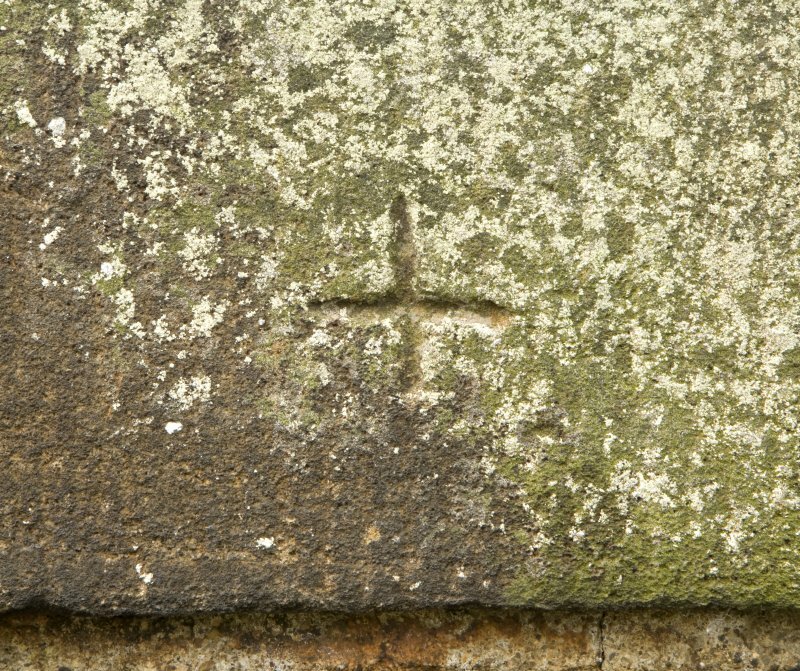 Detail of possible masons mark in form of small 'cross' on S side parapet. 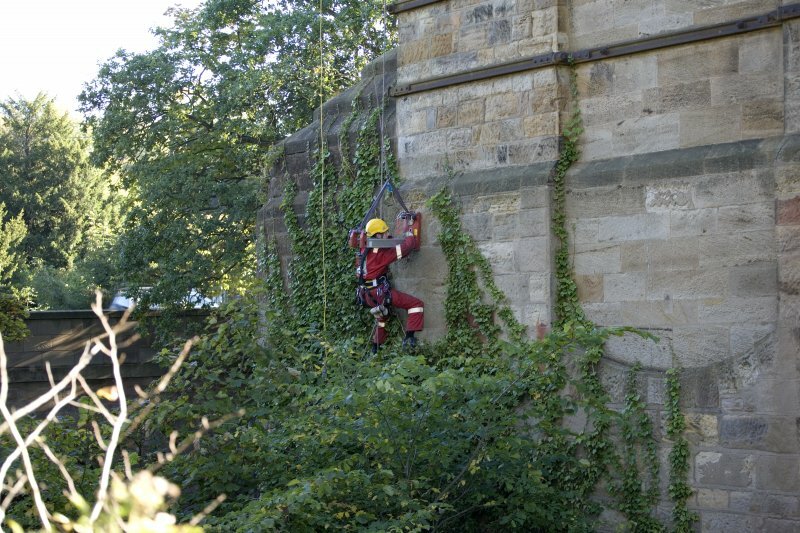 General view from NE, of drill operators abseiling whilst test drilling lower pier of viaduct. View from NE of test drilling work on lower pier and cutwater of viaduct in preparation for rebuilding the railway. 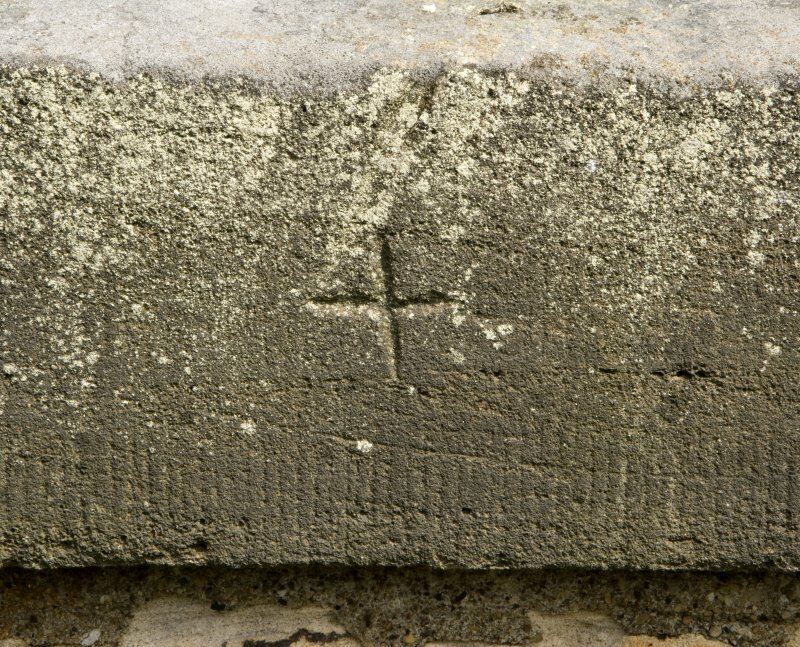 Detail of possible inscribed date on N parapet. 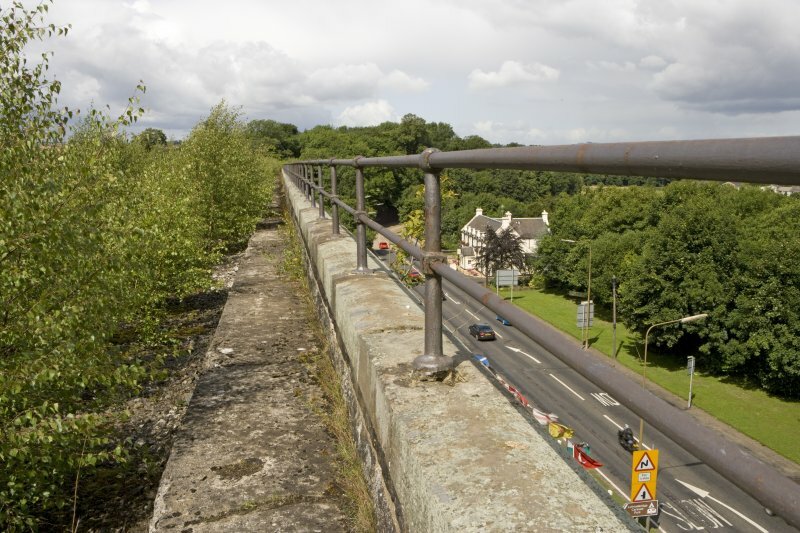 Detail of handrail section on S parapet. 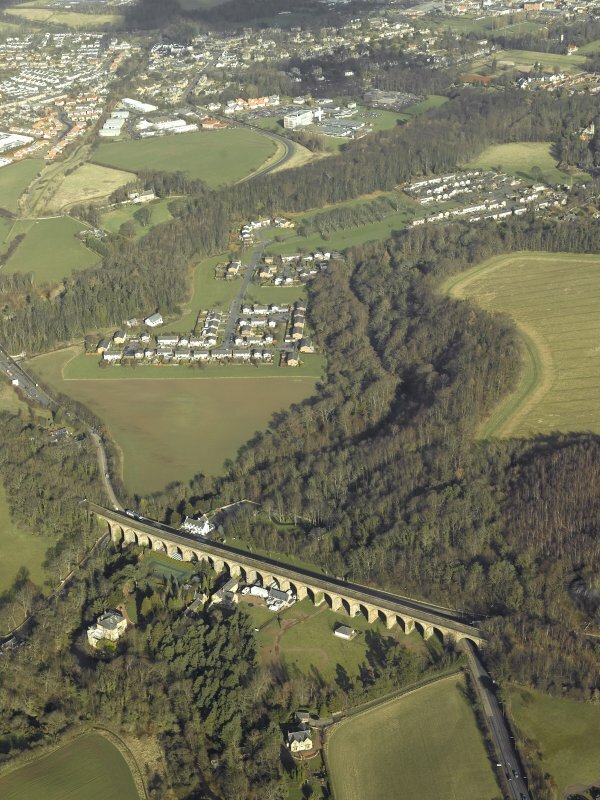 Oblique aerial view centred on Newbattle Railway Viaduct with King's Gate housing estate i the background, taken from the S.
Detail of handrail on parapet showing Lady Victoria colliery headstock in the distance. View of bridge deck walkway and parapet with handrail on S side from SE. 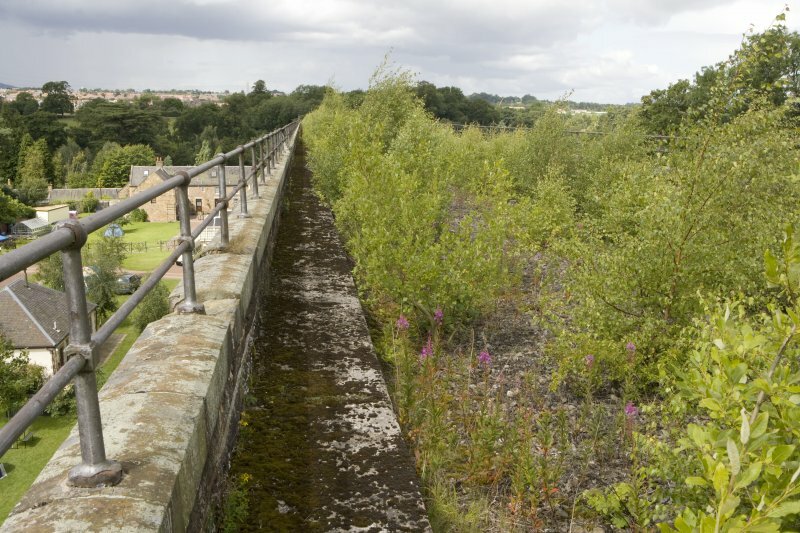 General view of bridge deck, parapet and handrail on parapet with surviving ballast. 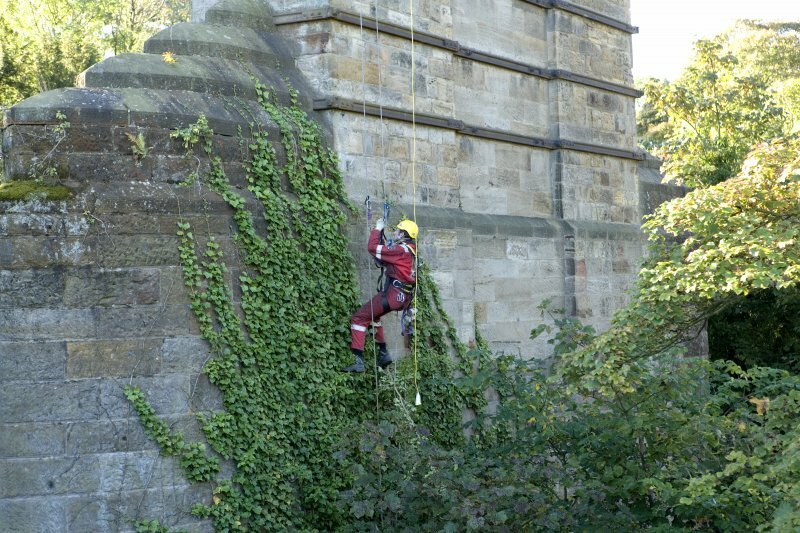 General view from NE, of drill operator abseiling whilst test drilling lower pier of viaduct. 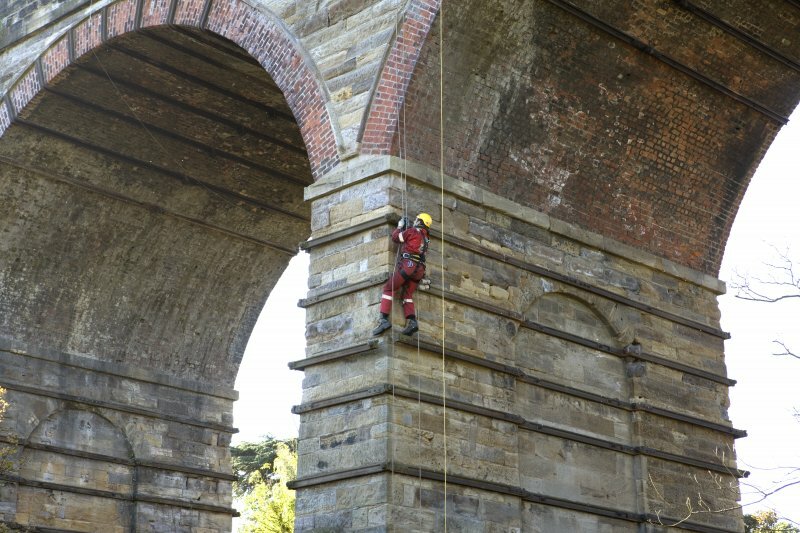 Detail, view from NE, of drill operator abseiling whilst test drilling lower pier of viaduct. Newbattle Viaduct (Lothianbridge/South Esk Viaduct) General view from NW. Not to be confused with Glenesk Bridge (NT 32372 67136), for which see NT36NW 171. For corresponding road bridge (adjacent to NE), see NT36SW 65. 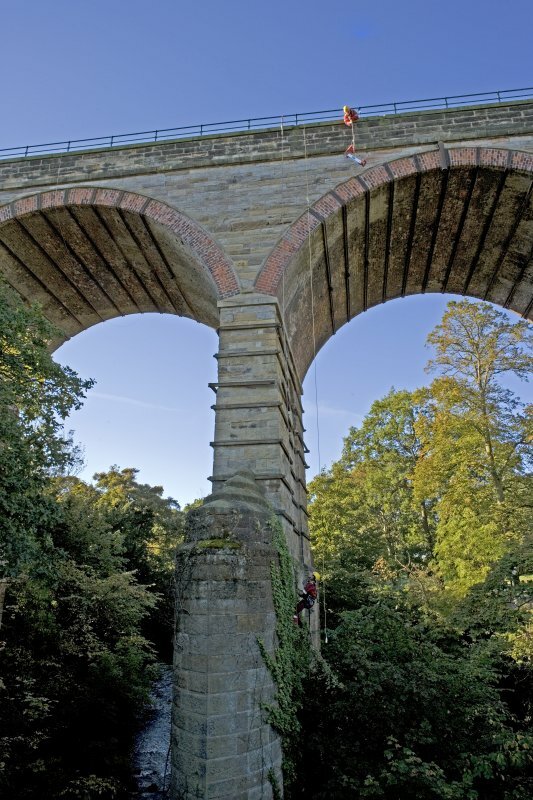 The Object Name Book of the Ordnance Survey describes Newbattle Viaduct as 'A viaduct on the Edinburgh and Hawick line of Railway on the estate of Newbattle it consists of 22 arches spanning the River Esk and a ravine and was built at an expense of £21,000. 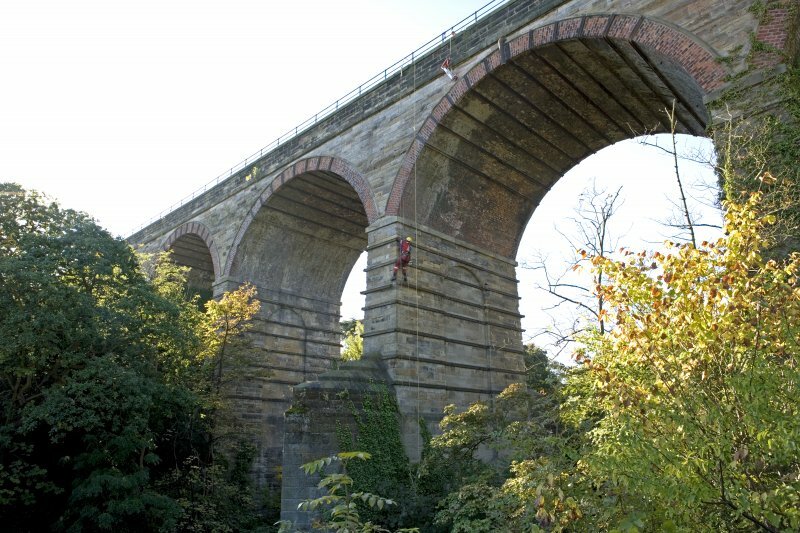 This spectacular bridge/viaduct across the River South Esk, constructed at his expense, enabled the Marquis of Lothian to extend the Edinburgh and Dalkeith Railway S from Dalhousie Mains to his coal pits at Arniston. Stone pillars and cast iron Gothic arches supported the timber structure of the bridge, which was 1,011 ft. long. (Location cited as NT 325 650 to NT 329 648). 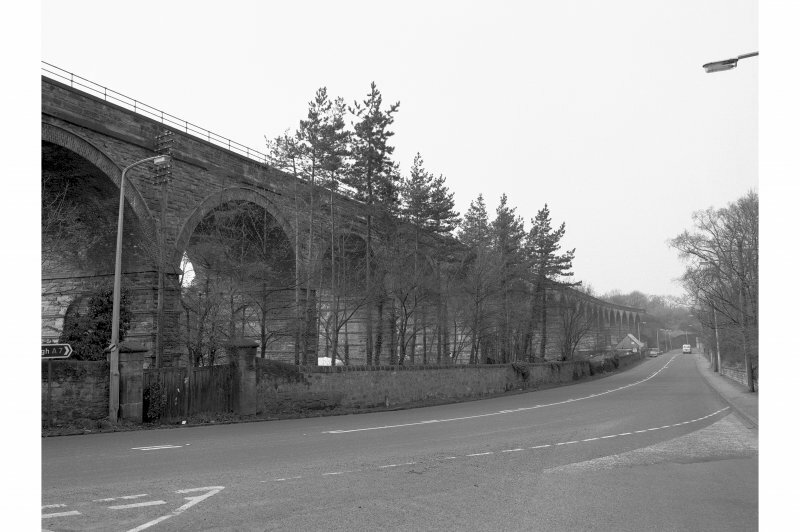 Dalhousie Viaduct, Newtongrange, opened 1849 by the Edinburgh and Hawick Rly. 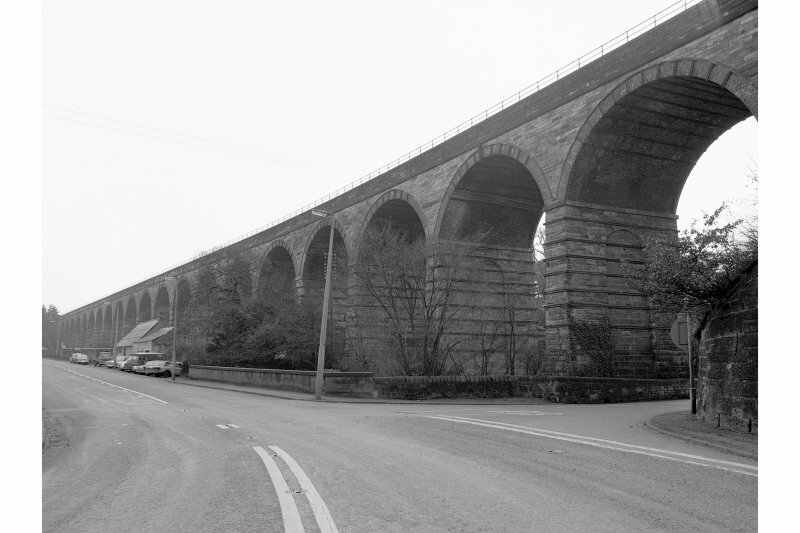 A 23-span viaduct, with brick arch rings, and coursed-rubble piers and spandrels. The last arch at the S end is a skew road arch with a masonry arch ring. 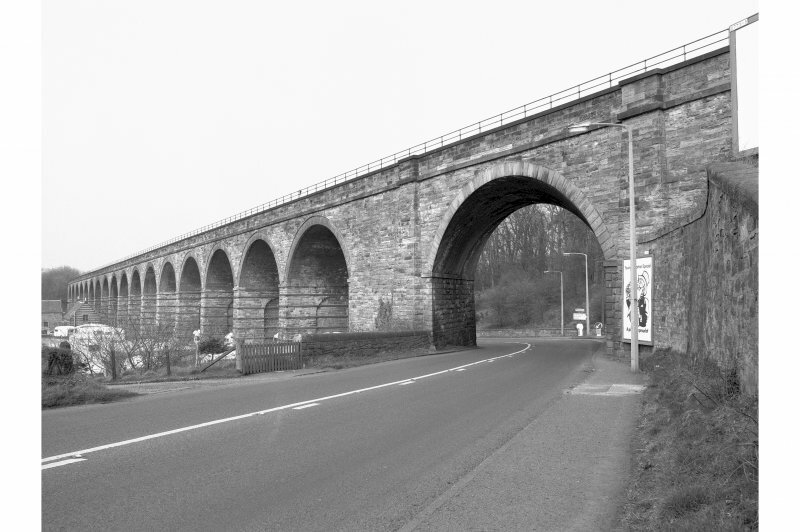 There was considerable debate over the financing of this extensive viaduct, a structure which was necessary in order to bridge the River South Esk and access the Lothian and Dundas collieries. The Marquis of Lothian was reluctant to spend the money due to the fact that the Lothian estates were entailed and it was considered unsuitable for Dundas, who owned the Arniston estate, to pay. However, it was eventually built, after a delay of some four years. This bridge across the River South Esk enabled the Marquis of Lothian to gain rail access to his colliery at Arniston after construction was completed in January 1832. G Douglas, A Jervis, M McDonald, N Niblock and W Barr 1993. 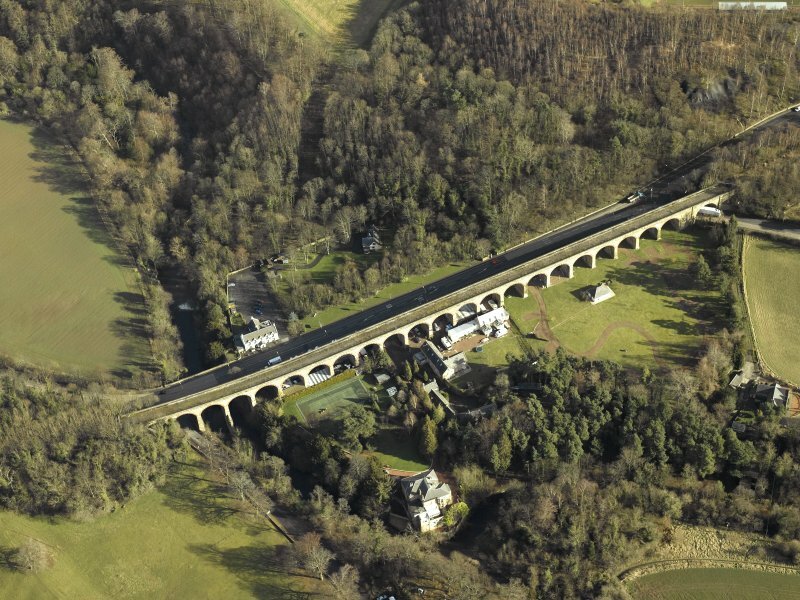 This viaduct is clearly marked on the 1st edition of the OS 6-inch map (Edinburghshire 1854, sheet 13), on the 2nd edition of the OS 6-inch map (Edinburghshire 1895, sheet viiiSW), on the current edition of the OS 1:10000 map (1991) and on the OS Basic Scale raster map (ND). The above sources do not concur over the ownership of the Arniston estate, Worling (1991) maintaining that it belonged to the Dundas family and the other sources placing the Arniston collieries in the hands of the Marquis of Lothian. The Lothian family owned the Newbattle estate and pits at Easthouses, Bryans and Lingerwood, all on the S side of the River South Esk, according to Worling, so would anyway have had a vested interest in extending the railway S of the river, regardless of the ownership of the Arniston colliery. 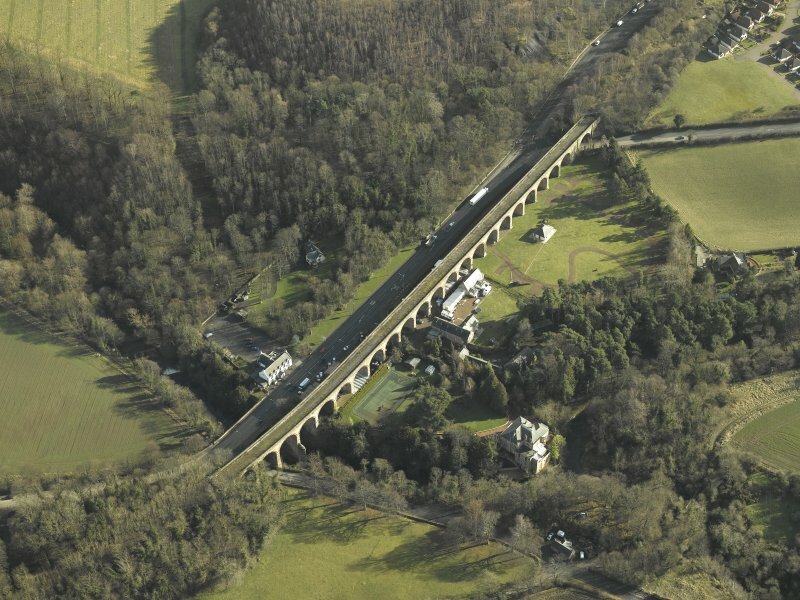 At NT 3282 6476 the viaduct carries the railway over a road which is clearly shown on the 1st edition of the OS 6-inch map (Edinburghshire 1854, sheeet 13) and on the 2nd edition of the OS 6-inch map (Edinburghshire 1895, sheet viiiSW). It is shown on the current edition of the OS 1:10000 map (1991) and on the OS Basic Scale raster map (ND) carrying the dismantled railway over the A7. Information from RCAHMS (MD) 2 August 2001. 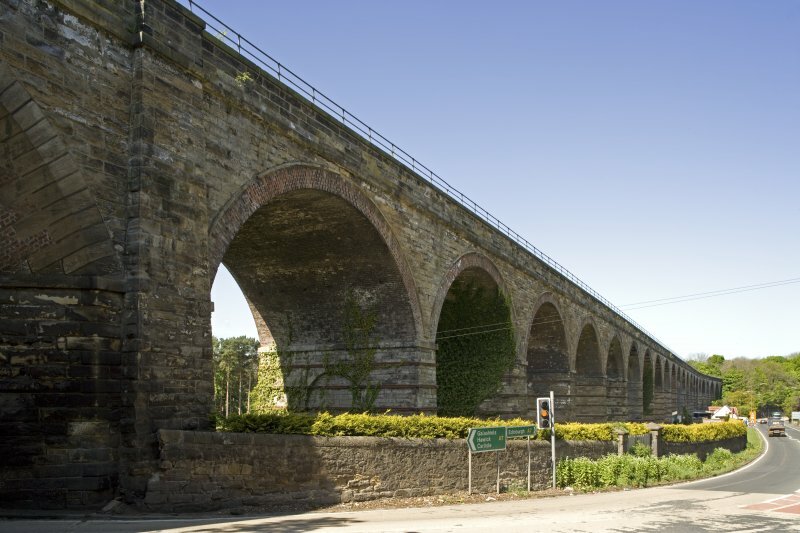 Completed in 1847 by John Miller, a long disused viaduct which carried the Waverley route from Edinburgh to Carlisle over the valley of the River South Esk to the north-west of Newtongrange (NT36SW 63). 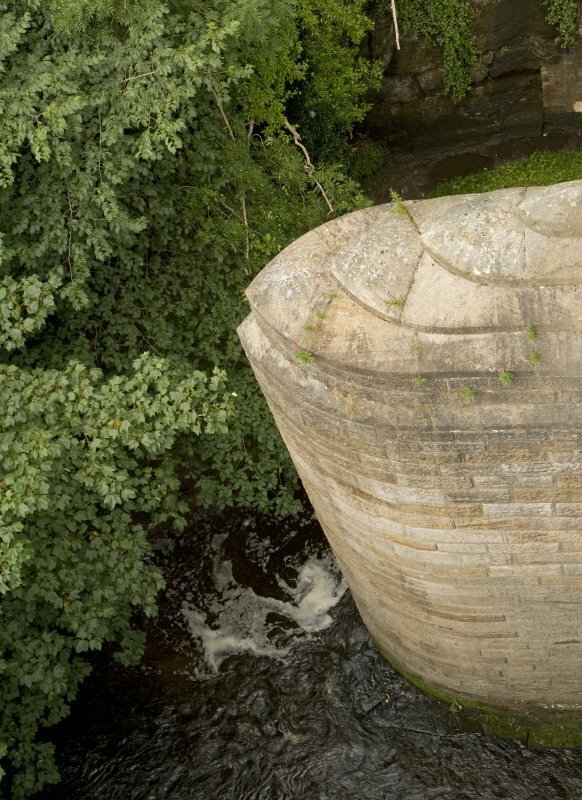 It comprises 23 rock-faced sandstone semi-circular arches, the piers of which have been reinforced with iron strappings. The viaduct passes over the river at its north-west end, the much longer pier being protected from the action of the river by deep curved cutwaters. Information from RCAHMS (MKO), 2001. 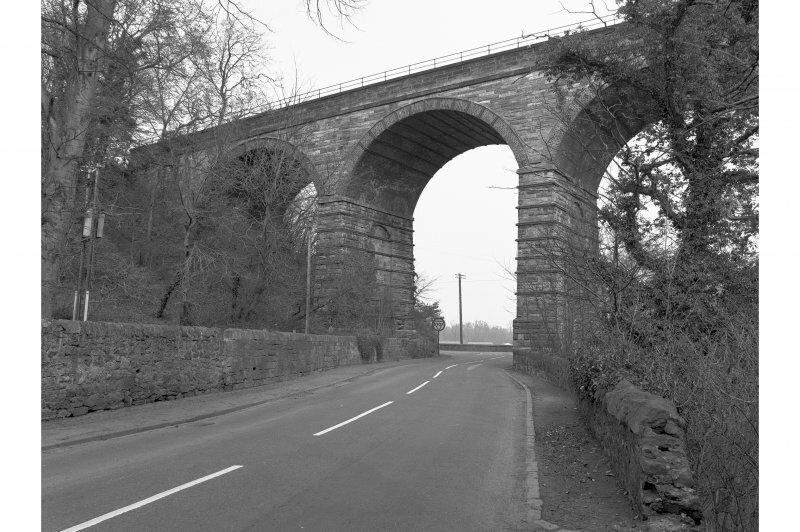 This viaduct carried the Edinburgh-Carlisle 'Waverley Route' of the (former) North British Rly over the RiverSouth Esk and two public roads; the river here forms the boundary between the parishes of Cockpen (to the NW) and Newbattle (to the SE). The entire line closed to regular passenger traffic on 6 January 1969. The viaduct apparently forms part of a cycle track, but forms part of the portion of the route for which reopening is projected. The location assigned to this record defines the midpoint of the structure. The available map evidence suggests that it extends from NT C. 32561 64934 to NT c. 32841 64750. Information from RCAHMS (RJCM), 26 April 2006. 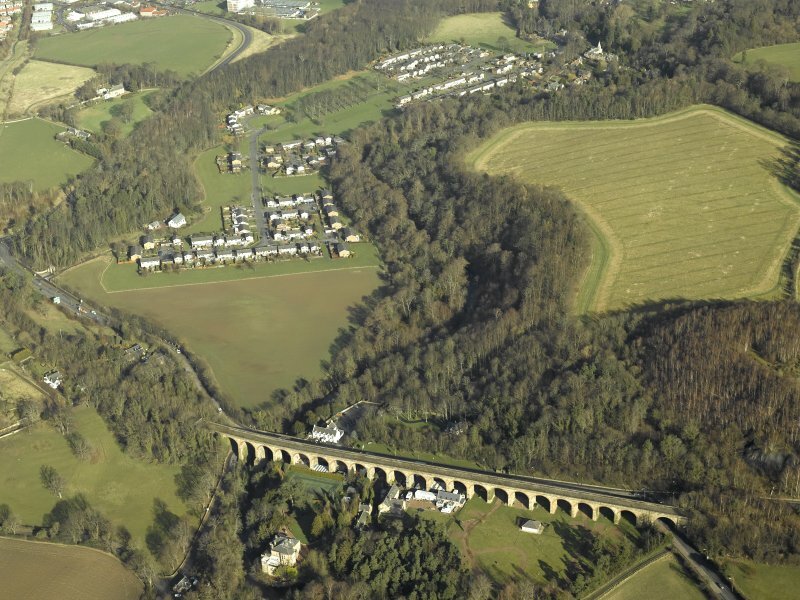 The Newbattle or Dalhousie Viaduct is a 23-span masonry viaduct with brick arch rings on the North British Edinburgh & Hawick Railway, passing about 80 ft above the South Esk.. 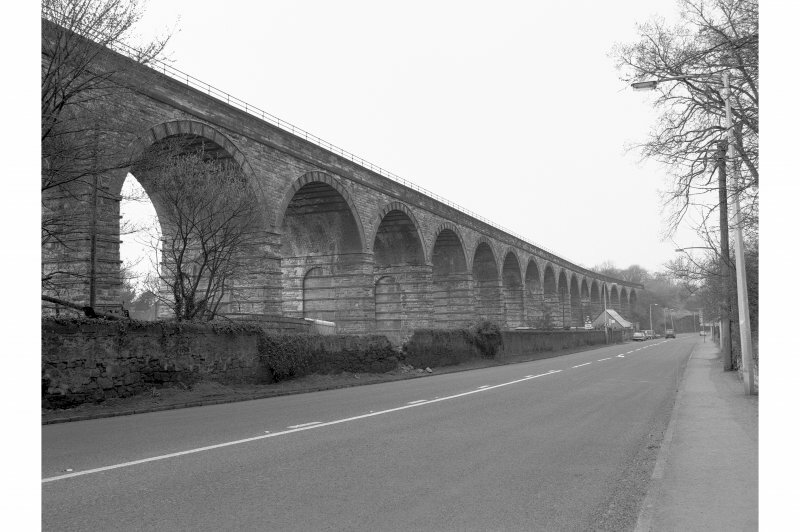 It was completed in 1847 and has 14 spans of 39 ft, seven of 38 ft, one of 44 ft and one of 43 ft 10 in., the easternmost over the A7 road being a skew arch. The brick arch rings are characteristic of Miller’s practice. 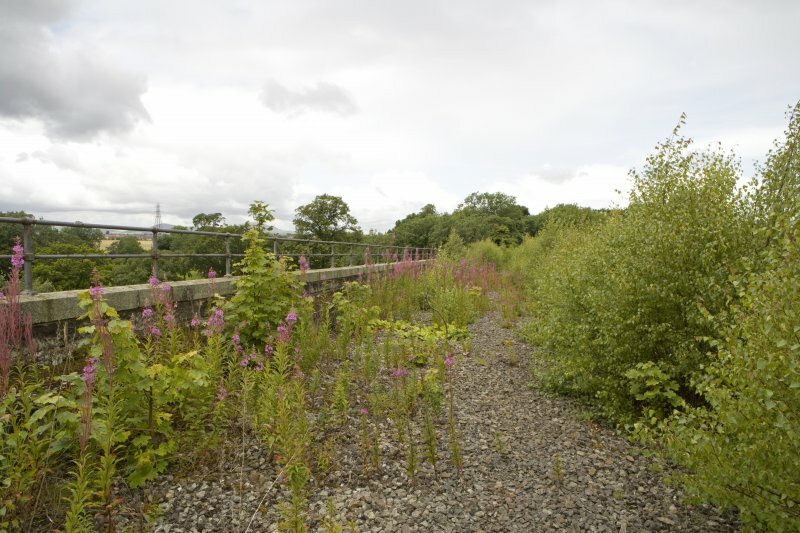 The line closed in 1972 but plans are now being made to re-open it to Hawick. 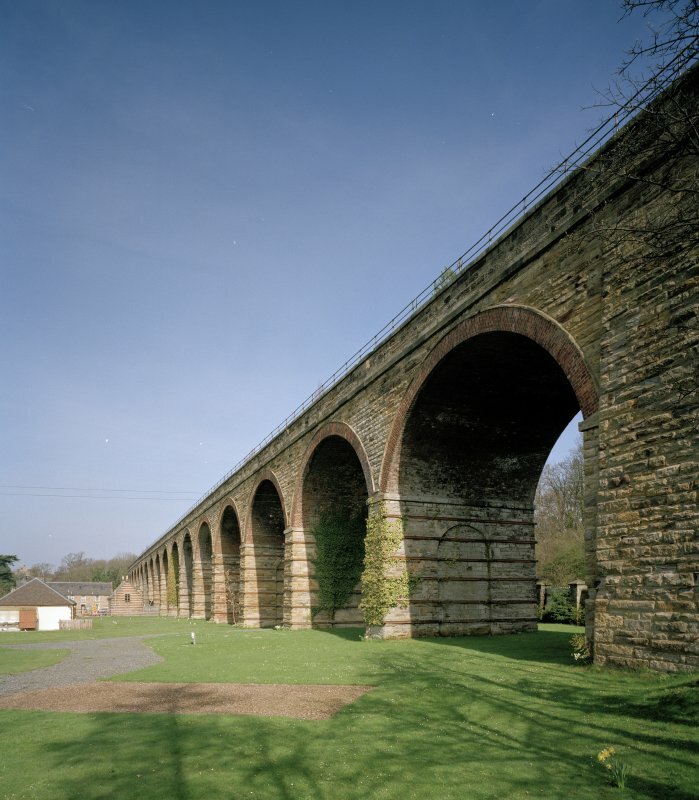 It replaced a unique 24- span cast-iron pointed arch and timber viaduct designed by John Williamson in 1830 and opened on 21 January 1832.